Born in Sydney (1949), Ken Bolton lives in Adelaide, South Australia. He is a poet, art critic, publisher, and editor of the literary magazines Otis Rush and Magic Sam. His major publications include a Selected Poems (Penguin/ ETT) and Untimely Meditations (Wakefield Press). With Melbourne poet John Jenkins he has also published a great deal of collaborative poetry including The Wallah Group (Little Esther) or Nutters Without Fetters (Press Press). Ken Bolton edited Homage to John Forbes, published by Brandl & Schlesinger in 2002. He lives with author Cath Kenneally. 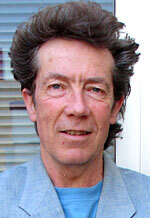 Ken Bolton is a poet, art critic, editor and publisher. From Sydney, since 1982 he has lived in Adelaide, South Australia. He produces the Little Esther books series and edited the magazines Otis Rush and Magic Sam. His major literary collections to date are a Selected Poems (Penguin/ ETT, 1992) and Untimely Meditations and At The Flash & At The Baci (Wakefield Press, 1997 and 2006). Ken Bolton has also written a number of collaborative books of poetry, verse novellas etc., with Melbourne writer John Jenkins. In 2000 he had a six month Australia Council residency in Rome. He edited the book Homage to John Forbes (Brandl & Schlesinger, 2002). For money (though not much money) he runs Dark Horsey bookshop at the Experimental Art Foundation. He is interested in art criticism and art history, continental philosophy and in history and politics generally — and in the innovative side of literature. Ken Bolton’s art criticism has appeared in The CAC Broadsheet, Artlink, Otis Rush and, regularly in the early 90s, in The Advertiser, Adelaide publications. And he has published in Photofile, Art and Text, Art Monthly, Meanjin, Agenda and Like and in Eyeline. Ken Bolton studied Fine Arts at Sydney University where he tutored for a time. He has also taught in visual art or communications at: various art schools and universities, always for brief periods. He won Melbourne University’s Michel Wesley Wright Poetry Prize for 1990. More usually he is short-listed: Two Poems — A Drawing of the Sky for the 1991 Victorian Premier’s Award, Untimely Meditations for the NSW Premier’s award in 1999. In 2000 he spent six months in Rome, courtesy of the Literature Board of the Australia Council. Thoughtful — and yet forgetful, easily distracted, hardly there sometimes — his is a lyrical figure limned against the harsh outlines, the stark colours, of the art world in Adelaide, adding a word here, a thought there, in the general flux of words and deeds around town. There are a number of things he wishes to avoid in poetry (the cornily ‘poetic’, strong reliance on metaphor, and the supposedly ineffable and transcendent). More positively he writes to keep himself awake, & amused. When that fails he knows where to find a good book. His next book — which will be a good book — is a study of The Circus, its philosophy, melancholy, hopes and fun, and their material conditions. I don’t believe in impersonality especially. Nor do I rely on the first person to be necessarily ‘personal’, except maybe in effect. Still, I find I’ve begun the statement below in the impersonal third person. Why? There are a number of things Ken Bolton wishes to avoid in poetry (the cornily ‘poetic’, strong reliance on metaphor, and the supposedly ineffable and transcendent). More positively he writes to keep himself awake, and amused. Elements of the New York School have successively and (in phases) repeatedly been influences on his work — as read by a mind that took naturally to study of the visual world’s avant-gardes, from early to late modernism, and read through an aesthetic formed of equal parts (to use a drink-mixing metaphor at which one can only frown) Manet, Bonnard, Picabia, Kirchner, Braque, Rauschenberg, Eva Hesse, Pollock and Tony Tuckson, Stella and Noel Sheridan, De Chirico and Beckmann, and so on. Anyway, I can hardly bear to rabbit on like this about my work: it’s usually ‘self-conscious’ by one criteria or another. It sometimes uses collage as a principle — or as an aesthetic (sometimes attempting something like the ‘beauty’ that I suppose, say, Tony Tuckson or Joan Snyder would aim at in painting and here using material from various, disparate sources, at other times selecting from material that is already inherently related — all stemming from a single poem maybe). But often the poems are more or less impressionistic and stem from O’Hara’s I-do-this-I-do-that model, Whalen’s or Berrigan’s ‘relaxed mechanic’ aesthetic and whoever I’ve been reading last: James Schuyler, Pam Brown, Laurie Duggan, Tony Towle… In these cases the poems hope partly to be a ‘graph of the mind’ and partly hope to ‘do’ some thinking. (While this is still what I do I’ve grown accustomed to the idea that my thinking is not especially profound. “But it’s mine”? Well, No, I’m not sure it’s all that original, either.) Finally, the poems would hope to be artefacts, I guess, as well. This triangle of goals — is it a triangle? — pulls each of the poems in various directions: some nearer to one or other of the desired ends. I’ve written a good deal collaboratively with poet John Jenkins: the same criteria apply (from my end) — though keyed more exclusively towards ‘fun’. John and I hardly discuss the poems except off-handedly. As an ingedient his criteria must be factored in as well, but, as I say, I don’t know. Ken Bolton’s poetry has appeared in all major Australian literary journals (including Meanjin, Overland, Heat, Jacket, Scripsi, Southerly, Otis Rush) & in some overseas journals. — Homage To John Forbes — Brandl & Schlesinger, Sydney 2002.